Firstly a huge thank you to MadLab for hosting #3DPM and making us feel so welcome! MadLab is really interested in making our widening participation objectives happen, and together we're going to achieve something really special for 3D printing in Manchester! Whilst the ground floor was the scene of mass permaculture, #3DPM had the top floor to house the 3D printers provided by Mark and Keith. 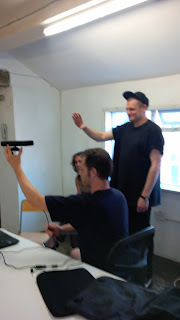 As I bundled into MadLab fifteen minutes late (thank you traffic jams), I found a room full of new faces - I wondered what new directions the group would take this week! Keith kickstarting the event introducing the 3D printer to all the new faces! Today Keith set about explaining how to set up his modified Mendel with ABS plastic. Much the same as with PLA, but he used Kapton tape to prepare the base for the printed item to sit on. He also began to explain Google Sketch-up, the free design tool supported by Google. This week, the group began to fluidly switch between groups working on basic and advanced projects, the possibilities of 3D scanning, and discussions about where the group was heading and legal implications of 3D printing and OEM parts. Part way through the meeting, Dave from MadLab dropped in to see how we were getting on and to talk about a survey they were putting together to see how all groups inter-connected. At #3DPM has plans to begin projects with the groups of programmers and DIY biologists at MadLab. 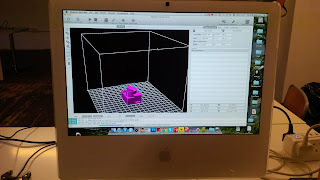 After Keith had run through the basics of 3D printing from the printer set-up to design, we set them to it to design something for themselves that could be printed and taken away with them. James stepped up to the plate and designed something akin to a small church! However in an object lesson of how things can go wrong when you don't check to make sure all the lines are closed and attached to something else, this was perfect. 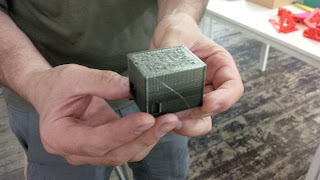 The bottom half of the printed object corresponded to the design, darker with higher density of plastic, with a high resolution recess where required. However the top half was not properly joined up in design and the result was mostly supporting 'in-fill' plastic. This looks less black due to its lower density. What would have been found if we etched away the in-fill, was that the designed structures were buried inside. Mark came and brought his 3D scanning tool, which is his own effort using a Kinect originally from an Xbox console, and available software called ReConstruct Me. This software allows you to scan anything into an object that can be converted into a printable file. Using Craig as a guinea pig we had him pose whilst Mark rotated the camera around him for the scan. 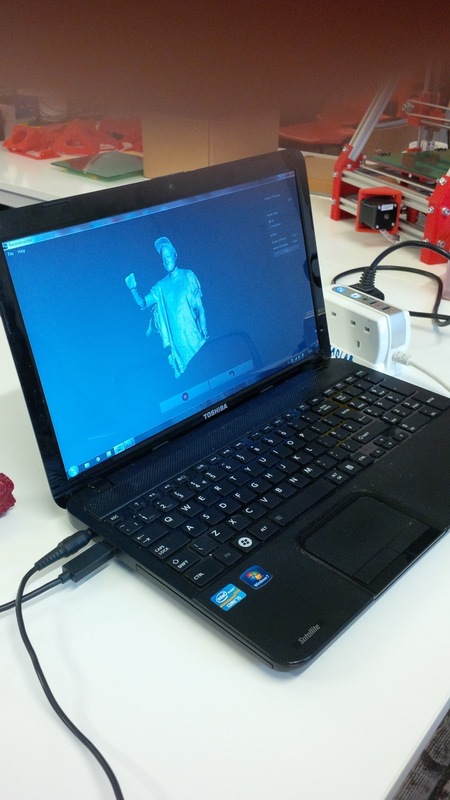 We then watched as the software quickly reconstructed what it had seen after a quick, less than optimally stable scan. 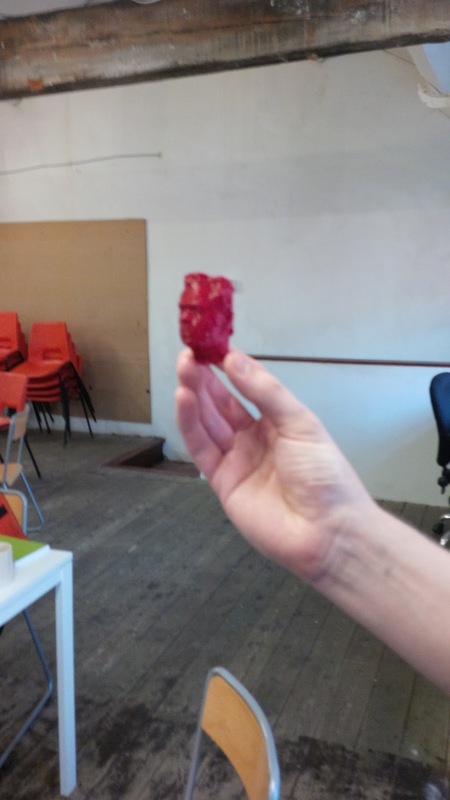 We even had a little red printed model of a scan Mark had done earlier, and it left us wondering why it looked like Max Headroom, and more importantly what we could each do with this kind of technology. Especially as with the arrival of Xbox one and the improved Kinect this Christmas, high-end scanning was at the tips of our fingers! We had a really fruitful discussion about intellectual property, and the hypothetical situation of wanting to recreate an OEM engineered part using a 3D printer. Would the designer of the part decide that they would litigate to protect their R&D investment? We all began the discussion, which brought everyone up to speed about what intellectual property (I.P.) was, and what it meant for the user on the street - the war between Apple and Samsung recently a case in point. It became clear to us that the we wondered whether there could be dispensation from usual IP if we were making a copy for ourselves on a private basis. I.e. would our printed items be treated as a cassette tape copy, which we could make freely; or as a digital MP3 which was not legally allowed to be copied. In the future we'll try to bring in an I.P. lawyer for a brief discussion of of their opinions. There was some progress on other projects, but we'll discuss them when we've more to say! Our next meeting is on the 29th of July, and we'll be meeting fortnightly after that. 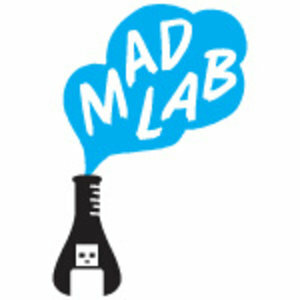 We'll post the dates in each weeks blog, but check out the MadLab site to get the low-down on future dates. So until then, come one and all, all new members are welcome!